Santa Cruz’s CAN (Community Agroecology Network) supports small-scale coffee farmers in Nicaragua and Mexico; when you buy products like AgroEco coffee (roasted by Santa Cruz Coffee Roasting Company) you are helping CAN fulfill its mission. CAN has brought 14 youth from Nicaragua, Mexico, and Costa Rica to Santa Cruz to take part in the 3rd International Youth Exchange for Food Security and Sovereignty (April 8-16, 2013). There are several free public events (read more) that both educate and enable people to meet youth from the communities that grow the coffee that CAN sells as Agro®Eco Coffee. Two of the events are at New Leaf Market (Westside Location) and Swanton Berry Farm. Sat, April 13 at Swanton Berry Farm, Highway One in Davenport: From 1 – 4 p.m. there will be a “Fun Farm Fundraiser” for CAN’s International Youth Network. 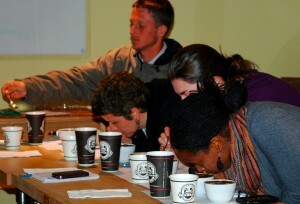 Activities include coffee sack races, art, music, coffee tasting, and farm tours. It’s billed as a good activity for kids, and of course there will be plenty of strawberries. More information: The mission of international organization CAN is to sustain rural livelihoods and environments by integrating research, education, and trade innovations. CAN’s vision is for a global economy where people, healthy food systems, and the environment come first. CAN International Youth Network for Food Security is a two-year initiative that targets the youth population of rural communities in Mexico and Central America, giving them skills, techniques, and knowledge to create locally-owned businesses that will provide support to CAN’s ongoing agroecology-based food security projects. AgroEco®Coffee is the product of a collaboration among small-scale coffee farmer cooperatives, coffee roasters, university scientists, and CAN. Through this collaboration, farmers receive technical support, ongoing ecological monitoring, and evaluation of sustainable farming practices.